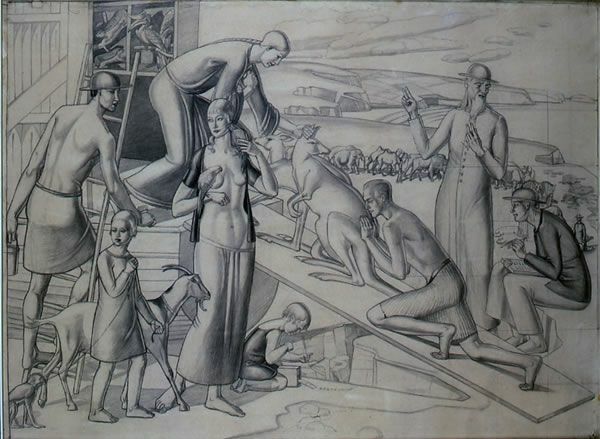 Gladys Hynes was born in Indore, India, to an Irish Catholic family, with whom she emigrated to London in 1891, later studying at the London School of Art in Earl’s Court. After her family moved to Penzance in 1906, she attended the Stanhope Forbes School of Painting, Newlyn, She returned to London in 1919, where she settled in Hampstead. Hynes was a supporter of the Irish Republican cause (her correspondence with Desmond Fitzgerald is the subject of an article by Ed Vulliamy in The Guardian 26.03.2016). A member of the CWSS, she was also an impassioned campaigner for women’s rights, often challenging the social construction of gender and sexuality in her work. Many of the paintings she produced during WWII were shaped by her mainly pacifist convictions. During her career, Hynes contributed to Roger Fry’s (1866– 1934) Omega Workshops, illustrated books – including the folio edition of Ezra Pound’s A Draft of the Cantos nos. XVII to XXVII (1928) – undertook sculpture commissions and theatre designs. She exhibited with the RA, the LG, the International Society of Sculptors, the Paris Salon and at the 1924 Venice Biennale.